Maersk « What Happened to the Portcullis? According to Aquaculture NZ, the Port of Auckland came up with the idea after the BBC described container shipping as an “invisible industry which brings you 90 percent of everything”. In an attempt to break into the public sphere, port of Auckland’s head of communication is turning to social networking site Twitter through the #ArtBoxNZ. 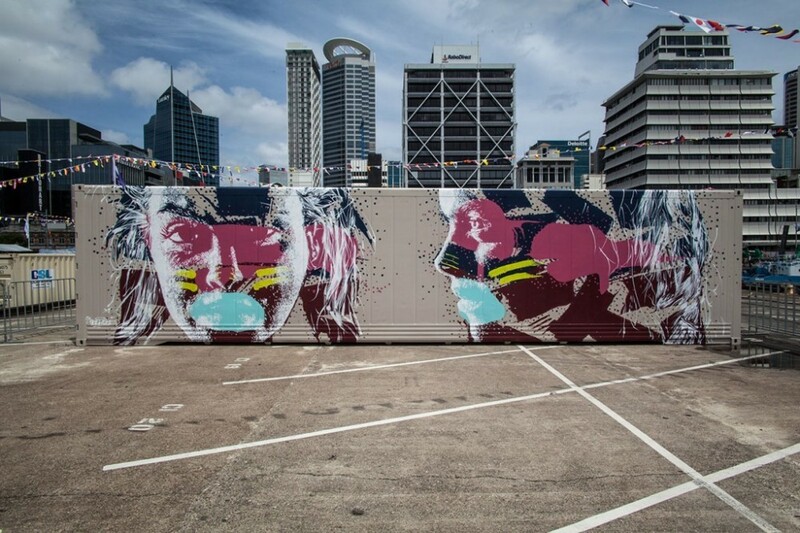 Whilst the container journeys the globe, people are encouraged to photograph the colourful container and share their respective images with Maersk Line and Ports of Auckland using the hashtag #ArtBoxNZ as well as #MaerskLine and #PortsofAuckland. 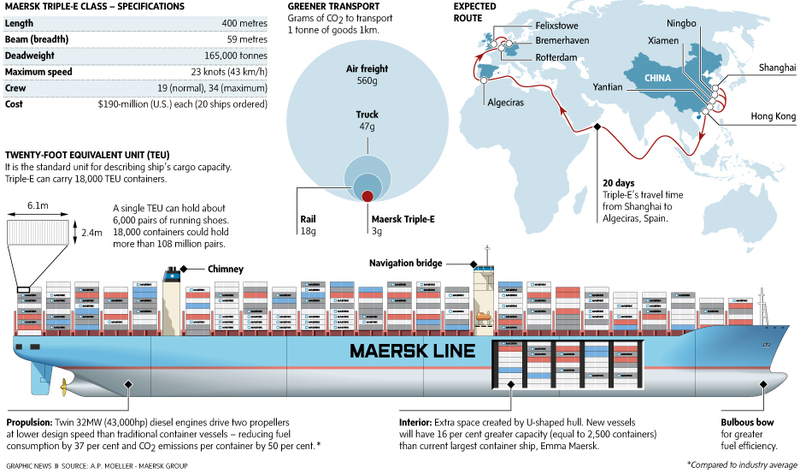 The world’s largest cargo ship is leaving its shipyard this week to prepare for its July 15 maiden voyage, but much of its cargo space will be under-utilized as many ports don’t have the ability unload the 20-story-high container stacks the vessel can lug between Asia and Europe. The ship, a $185-million, 1,300-foot long behemoth with a capacity of 18,000 containers, is a gamble for the vessel’s owner, Danish group A.P. Møller-Maersk A/S. Freight, which has been so battered by the recent global economic downturn that at one point it had hundreds of cargo ships sitting idle in Singapore. The ship is so big, it’s essentially leap-frogged over many ports’ ability to off-load it when it’s at full capacity. “We will operate it as a smaller ship for the first few months while ports upgrade their cranes,” Lars Jensen, head of Maersk Line’s Asia-Europe operations, told Dow Jones Newswires. 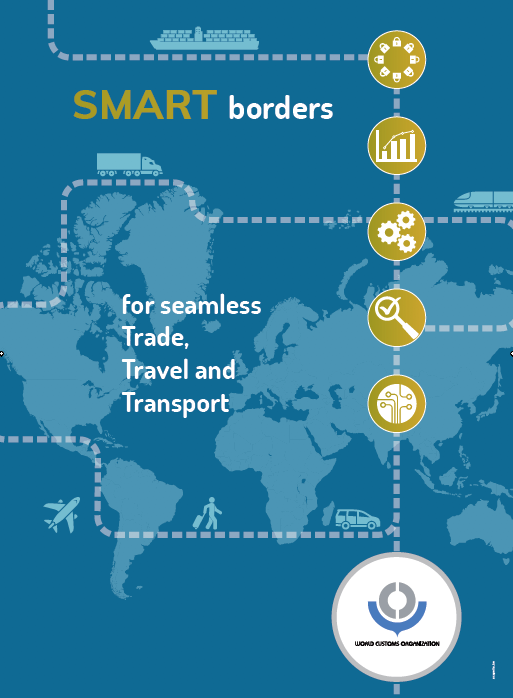 The problem is that ports lack gantries — those giant square-shaped cranes that slide over loaded cargo ships and pick up or drop off loaded containers — that can accommodate a fully loaded Triple E. So before Maersk can utilize the ship’s full capacity at major ports, many of those ports have to invest in upgrading, a process that could take years. A TV channel is to broadcast a series of six programmes showing how the world’s largest vessels – Maersk Line’s 18,000teu Triple-E containerships were built. 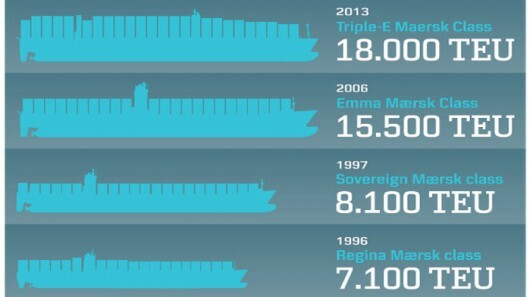 Maersk has given the Discovery Channel access to every stage of the Triple-E build; from the design of the vessel’s unique hull to the construction of the enormous engines and propellers, from the environmental improvements and safety systems to the ship’s naming ceremony and maiden voyage on the Asia-Europe route. The series will also focus on lives of some of the people involved, including the naval architect, the site team supervising the build and the captain as he prepares for the maiden voyage. “The Triple-E is an exceptional ship, in terms of its size as well as its energy saving technology and design. We’re excited about these vessels and proud to have Discovery Channel as a partner for showing how it is built and the people and passion behind it,” says Morten Engelstoft, Chief Operating Officer, Maersk Line. 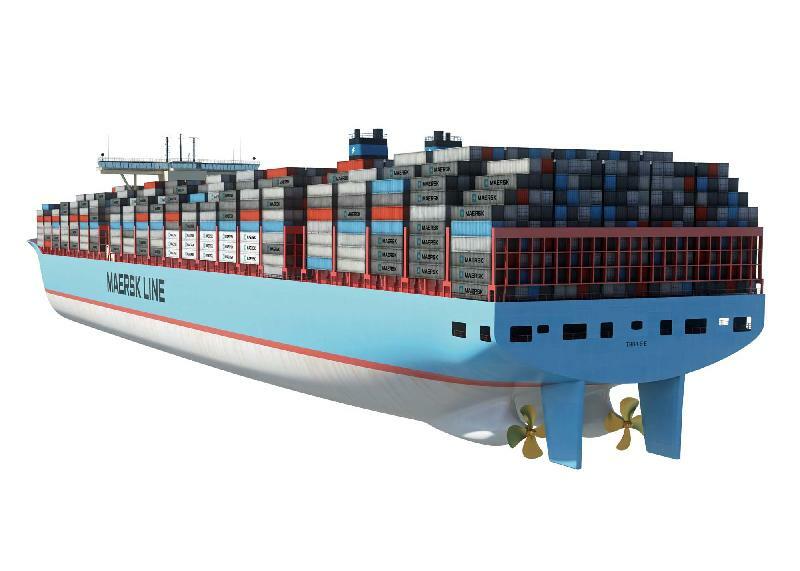 The World’s Largest Ship will air on Discovery Channel in November, but to save you waiting all that time, Maersk Line has made available a time lapse video of the building of the Triple-E, that consists of 50,000 photos taken over a three-month period. Click here to watch video clip! South African logistics and shipping firm Grindrod has continued its expansion programme, with the purchase of Safmarine’s 51% stake in Ocean Africa Container Lines. Grinrdod gave no details of the price paid for Safmarine’s stake in Ocean Africa Container Lines (OACL), but Grindrod now fully owns the company, which operates a feeder service with four vessels between Durban and Angola, calling at several ports in between, including in Namibia and Angola. OACL’s former COO, Mahmood Simjee, has now been appointed CEO. Grindrod hopes that OACL can continue to benefit from close ties with Safmarine and the latter’s parent company, Maersk. OACL could take advantage of Ngqura’s growing role as a transhipment port, particularly with Angolan ports. The shipping line previously operated between Durban and Mozambican ports and could again resume this role. Röhlig-Grindrod, a joint venture between Grindrod Limited and Röhlig International, has also acquired Sturrock Group’s clearing and freight forwarding division in exchange for a 15% stake in Röhlig-Grindrod, leaving the founding partners with 42.5% equity each in the venture. The inclusion of black empowerment partners in Sturrock Group helps Röhlig-Grindrod to fulfil its empowerment requirements. 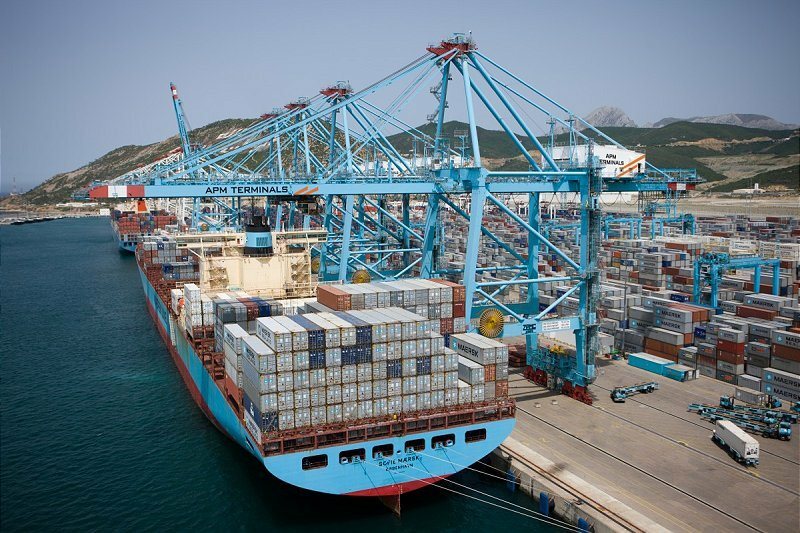 Maersk Line has agreed to pay an out of court settlement of US$31.9 million to the US government to resolve allegations that it submitted false claims for inflated shipping costs incurred during the transport of containerised cargo to support US troops in Afghanistan and Iraq. The government claimed Maersk was allegedly billing in excess of the contractual rate to maintain the operation of refrigerated containers holding perishable cargo at a terminal in Karachi, Pakistan, and at US military bases in Afghanistan; billing excessive detention charges (or late fees) by failing to account for cargo transit times and a contractual grace period; billing for container delivery delays improperly attributed to the US government; billing for container GPS tracking and security services that were not provided, or only partially provided; and failing to credit the US government for rebates of container storage fees received by Maersk’s subcontractor at a Kuwaiti port. In 2009, APL was fined $26.3 million by the US Department of Justice, and Agility is still fighting a claim for overcharging in 2010. Makes you wonder – did they declare the correct cargo information on their manifest? I guess it really does not matter since the cargo was destined for Afghanistan and Pakistan in any event. Don’t believe these countries require advance manifest reporting just yet.